There is a trust component that is built into the work we’re doing with implementing Salesforce and that has huge implications in terms of ownership and buy-in. Salesforce is changing the way we think about the programs and services we provide to clients. The system will connect all of our staff (who operate in 20+ locations) to provide a quality continuum of services to clients. Tenderloin Housing Clinic is the largest provider of supportive housing to formerly homeless adults in San Francisco. In 2015 THC and Bigger Boat Consulting began a journey to transform the way THC staff work with one another and their clients. The first phase of the project focused on streamlining their client enrollment process to promote communication and collaboration, reduce paper and time between enrollment stages, and deliver easy and timely access to program and client data. The goal was to provide THC staff more time for client interaction so they can provide the additional support needed to keep people housed. For THC, a typical enrollment starts with a referral from a partner organization (private, nonprofit, or government). The client meets with a Housing Counselor to understand the THC program benefits and requirements and ensure sufficient financial support is available. Dependent upon the program, the client might meet with other members of the supportive housing team (Supportive Housing Manager, Case Manager) to confirm the match. Upon program acceptance, the client will meet once again with a Housing Counselor to sign contracts and make initial rent payment. Rental Accounts uses the information to create rent charge, apply payments, issue any balance disbursements, and set up ongoing financial management. With 10 distinct programs, more than 20 buildings, 6 funders, and 20+ sources of client benefits, there are many departures from this typical process. Like many organizations, this process was paper-based. Information was written down on pre-printed paper forms which were passed between departments. Some information was entered into inflexible custom databases and departmental spreadsheets while other information remained only on paper. Housing Counselors would commonly spend 15 minutes filling out forms for client signature and distribution to external entities during client appointments. 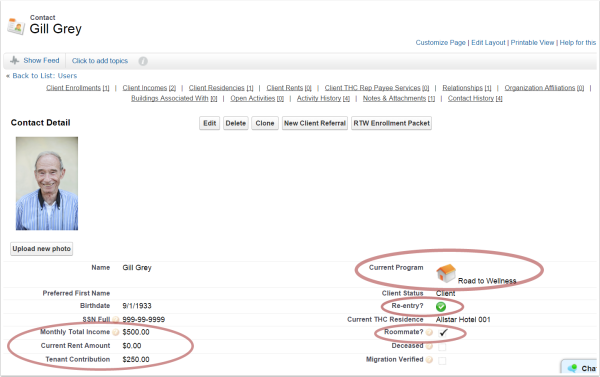 Most of the forms were simply rewriting the same client and program information over and over again. 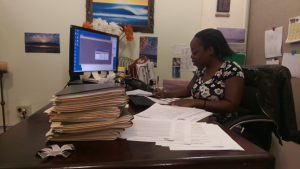 Housing Counselors struggled to determine which of the 50+ forms they needed to fill out for any particular client based on their income, program, and building. Reporting on client enrollment and programs required calling an in-house software developer, and waiting. THC managed to deliver quality services and meet funding objectives despite all these challenges, but it wasn’t easy. They were simply working too hard and they knew they could do more! Going completely paperless was not realistic for THC. External parties require paper based communication as do clients. What they can do is reduce the paper, streamline how they work with it, and make the information on the paper accessible to those who need it when they need it. Here’s how Bigger Boat partnered with THC to address their challenges along with some tips for those considering a similar path. 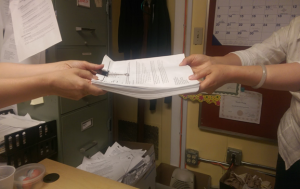 THC reduced paper by eliminating forms used for internal communications. 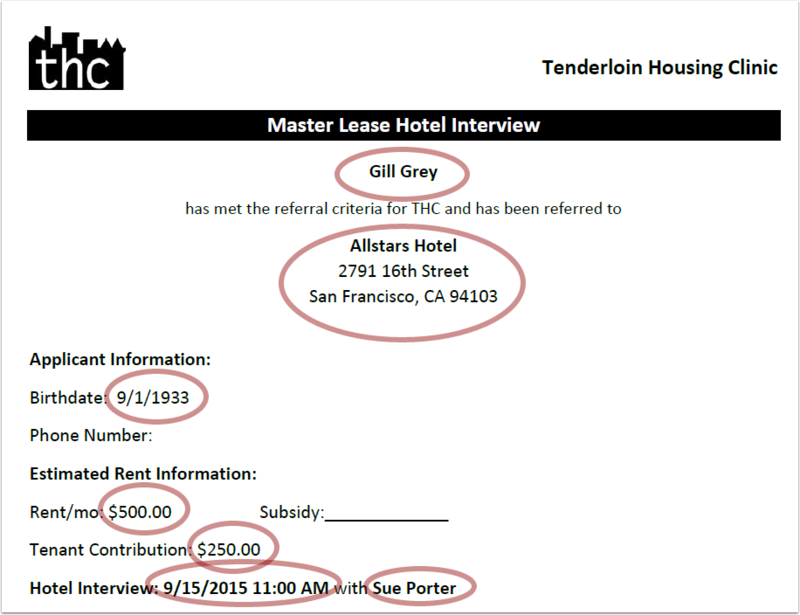 Housing Counselors now enter data directly into Salesforce while talking with the client, and that information is accessible by Rental Accounts and Program Managers immediately. More details are collected about the client, referral, income, building and significant milestones of the enrollment process (hotel interviews, follow-up appointments with referrers, and move-in dates). Turning a paper process into a computer based process was a big change for Housing Counselors, who really want to focus on the client in front of them. To help acquaint them with the new terminology, information, and steps, we built a simple Visual Flow to walk them through the screening stage where a majority of the client information was collected. The team needed more time to understand the new process, what worked, and what didn’t. The flexibility of Visual Flow helped us adapt to changes quickly with minimal investment. As the client progresses through enrollment, their enrollment status changes helping the Housing team track their progression. Dashboards, List Views, and Chatter feeds notify the Rental Accounts Specialist assigned to the client to review their enrollment and take the final steps. TIP: Consider flows or other flexible input forms to walk the person through the new process, but do not over think this or over invest in building this. Change is difficult, and having a simplified data entry screen can be a big win at rollout, but once they get familiar with the system, this could become cumbersome. Staff process will evolve as the team gets more familiar with the new tools, processes, and possibilities. Make it flexible and easy to change, instead of focusing on every possible edge case at the outset. You’ll find your users will have a new operating procedure within a few months of using new technology and many great ideas along the way. Paper is still a fact of life for THC. Many referrers, funders, and regulators still have paper based requirements. However, Salesforce generates and prints these forms on demand. Now the Housing Counselor simply clicks a button on the client record and the client’s screening packet is generated, including all the required forms with the client’s information pre-printed. We used Drawloop’s LOOP Document Services due to several specific requirements. Drawloop not only merges the data from Salesforce, it uses the data in Salesforce to determine which forms should be generated. Tip: Take the time to rethink the layout of your forms. Since these are not pre-printed forms, they can evolve over time. You don’t have to have everything perfect the first time. Review the information your external parties (funders, referrers, clients) have requested and why. There is a good chance some of the information you have been collecting and reporting is simply a limitation of paper. Important information is at the top of the client’s page and images are used to quickly convey critical elements to staff. This allows the Housing Counselors to quickly familiarize themselves with the client. Tip: Ask people what they want to know. Look at the paper and see what is being highlighted, bolded, crossed out and/or not filled in. This tells you a story about the information people really need. Once you have found the important information, use images, rollups, and links to highlight it. Individual communications between people in a variety of formats (email, paper, IM) were replaced by Chatter posts in Salesforce. 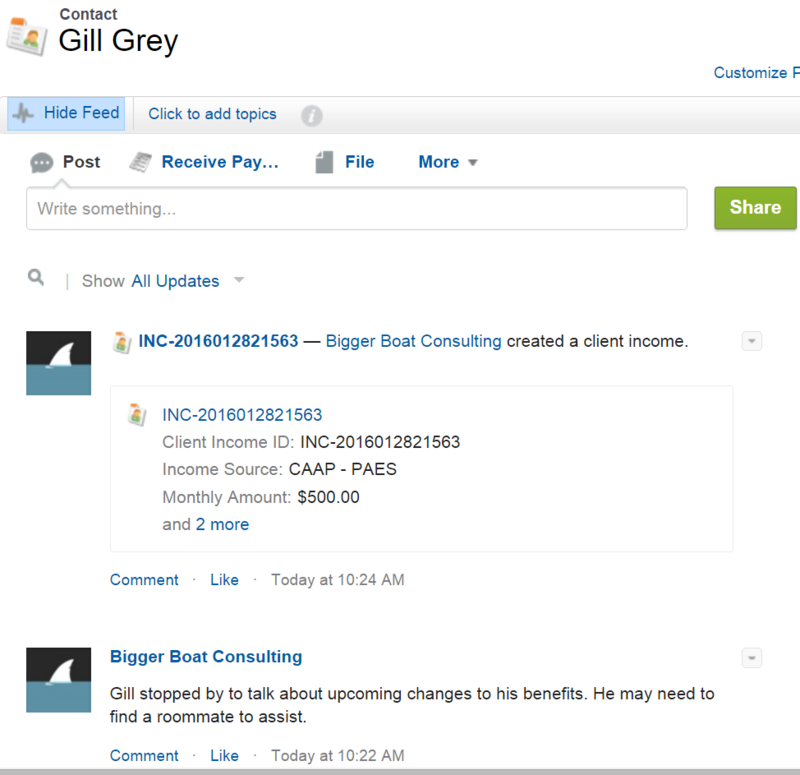 Key events like changes in income or benefits are recorded and automatically posted in Chatter. Now, they are visible right on the client’s record and also in a feed for each Rental Accounts Specialist to see just the news for their clients. This increased awareness of significant events, improving a client’s ability to remain housed. This also improved the accuracy of information and reduce the volume of communications as one post shares information to everyone who needs to know. Since Chatter posts are searchable, staff can easily find historical information and significant events. TIP: Leverage your organizational culture. THC’s adoption of Chatter came late in the project. After watching the behavior of the team, we realized they were very comfortable with instant messaging and social media tools. Enabling Chatter was a huge success that required almost no user training. 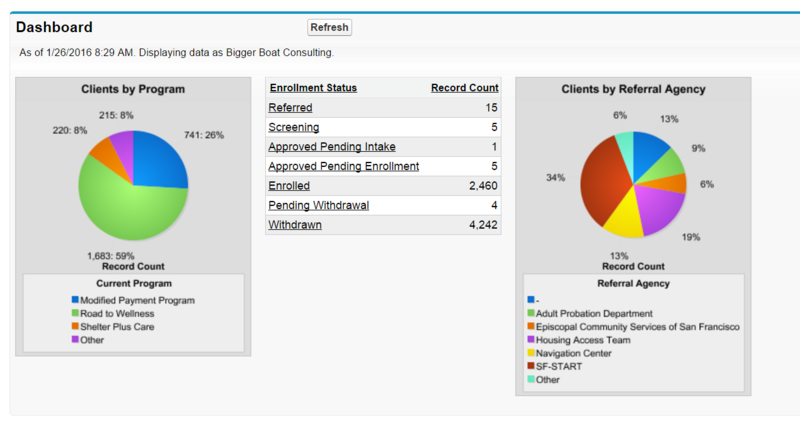 Dashboards with enrollment and program statistics are available and personalized for various roles. The Enrollment Dashboard allows the managers to quickly identify how many people are at each stage of the enrollment lifecycle so they can monitor and take action. Program and Department Managers can generate personalized reports without developer assistance. Charts are included in program detail pages to provide at a glance information about the program. In the months surrounding deployment, THC started a new program and opened two new buildings. Thanks to the flexibility and the process automation tools of the Salesforce platform, along with good decisions by the team and a lean project process, we were able to adapt. The THC enrollment process now uses less paper, has more accurate and timely information, and encourages communication. It may sound like a simple concept, but to be on the same page about a client’s situation in an agency the size of ours, is really revolutionary! Getting transparency into our colleagues’ work, streamlining processes across departments, and opening up the doors for clear communication is really a game-changer for THC. THC’s journey is not complete, which is why we work directly with users throughout the project, constantly learning more about how to make them more successful. Stay tuned as Bigger Boat and THC continue to engage the THC team to accomplish their mission: get and keep people housed.